You're nobody's fool, of course, but even the most discerning of minds can be thrown for a loop come April 1. From spray-on yoga pants to a laser-guided tactical necktie, here are six LOL-worthy wearables that proved too good to be true, and one that didn't. In a nod to 2013’s “Pantsgate,” where customers took Lululemon to task for its unintentionally see-through pants, the yogawear purveyor took the mickey out of itself on Tuesday by unveiling a $12,000 spray-on legging, inspired by a Jimmy Kimmel sketch and good for 12,000 applications. Spray-on clothing isn’t far from the realm of possibility, of course. Fabrican is just one firm experimenting with technology with the goal not only of creating bespoke clothing quickly and inexpensively, but also to provide new applications for the medical, transport, and chemical industries. From Bonobos comes “Techstyle,” a smart fabric that boasts “WiFiber” to keep you constantly connected to the world around you, “full-body synchronization” to activate features like GPS navigation, a “silent” alarm that jolts you into wakefulness—or possibly a coma—when you fall asleep in the wrong places, and an artificial intelligence that has more in common with the HAL 9000 than Siri. “These days, ‘fashion’ isn’t just about how your favorite shirt fits and looks but what it does,” says Lars Sodequist, the company’s alleged “head of wearables,” says in a video preview. 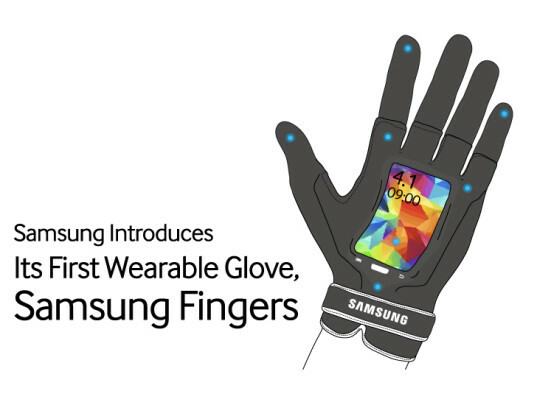 Samsung Fingers, according to the technology firm, “reinvents and modernizes” the classic use of the human hand. Pull a finger to get flatulent sound effects. Make the “sign of the horns” with your fingers to make a phone call, or gesture “hang loose” to accept one. Need to charge your glove? Just “conveniently and elegantly” raise your hand towards the sun for a shot of clean energy. What if you hate being interrupted? A “Talk to the Hand” function lets a would-be conversation hijacker record a message into the glove while you continue your dialogue undisturbed. American Eagle Outfitters is going to the dogs. What began as a April Fool’s joke—a spinoff clothing line for dogs appropriately dubbed “American Beagle Outfitters”—will become a reality by year’s end. When the company first announced the collection on March 24, it encouraged shoppers to sign up for waiting list to receive a first look, as well as 20 percent off American Eagle purchases with $1 per order benefitting the American Society for the Prevention of Cruelty to Animals. The concept was so well-received that American Eagle Outfitters wound up donating $100,000 to the cause. The seasoned pranksters at Think Geek added to their annual arsenal of tomfoolery a laser-guided tactical necktie designed to liven up the most boring meetings. Also, entertain cats. Made from impact-resistant, oleophobic glass, the helmet allows its wearer to send a tweet by making a simple “pecking” head motion. 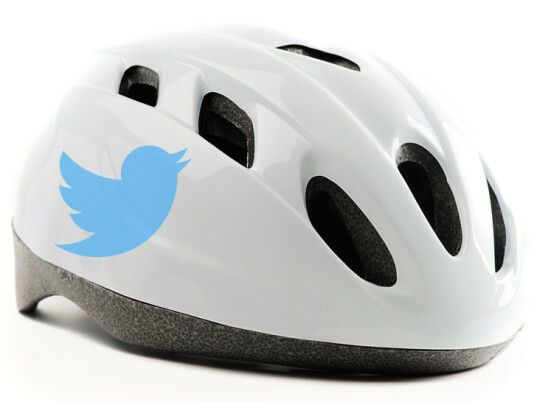 “In addition to the helmet, users can also purchase Twitter Helmet HD accessories including a hand-tooled leather case inspired by falconry hoods, feather-shaped Wi-Fi and cellular signal boosters, and a carbon fiber chinstrap with optional wattle-form factor microphone,” adds Twitter in a press release. People of Britain, prepare to have firmer, perter tushes. Virgin Active unveiled today a smart underpant that counts gluteus flexes much like a pedometer counts steps. The so-called “Smarty Pants” were developed in response to the bum selfie (a.k.a. “belfie”) craze that spreading across the United Kingdom. Coming next April: The “Pectometer” T-shirt and “Bicep-ometer” vest. In a nod to 2013's "Pantsgate," where customers took Lululemon to task for its unintentionally see-through pants, the yogawear purveyor took the mickey out of itself on Tuesday by unveiling a $12,000 spray-on legging, inspired by a Jimmy Kimmel sketch and good for 12,000 applications. "Our easy-spray, acrylic-adhesive formula is engineer to stay all day," the ad copy gushes. Plus, you've got options. "The adjustable rise means the fit is in your hands," the company adds. "Goodbye pants, hello comfort." Spray-on clothing isn't far from the realm of possibility, of course. Fabrican is just one firm experimenting with technology with the goal not only of creating bespoke clothing quickly and inexpensively, but also to provide new applications for the medical, transport, and chemical industries. From Bonobos comes "Techstyle," a smart fabric that boasts "WiFiber" to keep you constantly connected to the world around you, "full-body synchronization" to activate features like GPS navigation, a "silent" alarm that jolts you into wakefulness—or possibly a coma—when you fall asleep in the wrong places, and an artificial intelligence that has more in common with the HAL 9000 than Siri. "These days, 'fashion' isn't just about how your favorite shirt fits and looks but what it does," says Lars Sodequist, the company's alleged "head of wearables," says in a video preview. Samsung trumpeted its latest invention: "Samsung Fingers, the first all-over-hand wearable device with a flexible "Super Emo-LED" for the "technology-sensitive consumer." Samsung Fingers, according to the technology firm, "reinvents and modernizes" the classic use of the human hand. Pull a finger to get flatulent sound effects. Make the "sign of the horns" with your fingers to make a phone call, or gesture "hang loose" to accept one. Need to charge your glove? Just "conveniently and elegantly" raise your hand towards the sun for a shot of clean energy. What if you hate being interrupted? A "Talk to the Hand" function lets a would-be conversation hijacker record a message into the glove while you continue your dialogue undisturbed. American Eagle Outfitters is going to the dogs. What began as a April Fool's joke—a spinoff clothing line for dogs appropriately dubbed "American Beagle Outfitters"—will become a reality by year's end. When the company first announced the collection on March 24, it encouraged shoppers to sign up for waiting list to receive a first look, as well as 20 percent off American Eagle purchases with $1 per order benefitting the American Society for the Prevention of Cruelty to Animals. The concept was so well-received that American Eagle Outfitters wound up donating $100,000 to the cause. 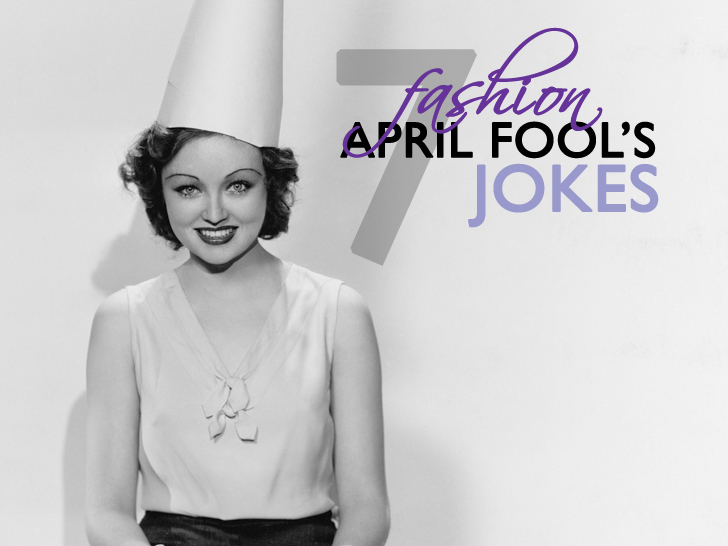 "We originally felt that April Fool's Day was the perfect opportunity for us to engage with our consumers in a fun, lighthearted way, all while supporting the ASPCA," Michael Leedy, chief marketing officer of American Eagle Outfitters, says in a statement. "Due to the tremendous positive response and excitement from our customers for the American Beagle Outfitters line, we decided to make a limited edition collection for Holiday 2014." "Use the MOLLE attachment system to bring along a set of your own whiteboard markers (because nobody ever throws the bad ones away), a first aid kit for those nasty handout papercuts, even your travel mug via carabiner (quick-release for those caffeine emergencies mid-meeting)," the retailer says. "But the best part is the built-in Class II laser, which you can use to bring attention to your important points, entertain office cats, or blind the random meeting-interrupting zombie. 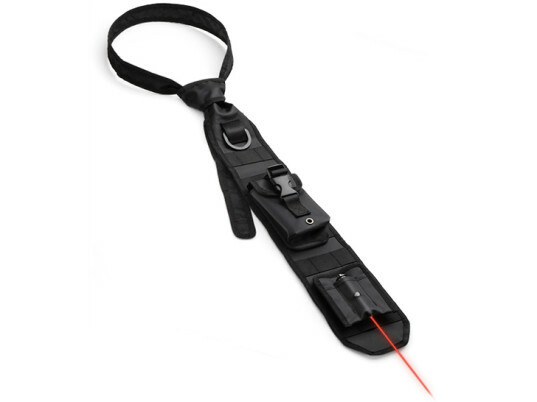 Once you experience Think Geek's Tactical Necktie with Laser Pointer, you'll wonder how you ever survived a meeting without it." People of Britain, prepare to have firmer, perter tushes. Virgin Active unveiled today a smart underpant that counts gluteus flexes much like a pedometer counts steps. The so-called "Smarty Pants" were developed in response to the bum selfie (a.k.a. "belfie") craze that spreading across the United Kingdom. "Each pair is fitted with a streamline sensor that hugs the wearer’s glutes and has been expertly placed to record their every clench," Virgin Active notes on its website. "A handy ‘Clench Counter’ in the sturdy waistband allows the user to keep a close eye on the number of clenches they have done." Coming next April: The "Pectometer" T-shirt and "Bicep-ometer" vest.